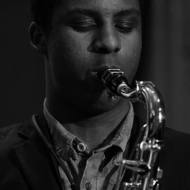 This Friday: Xhosa Cole plays at Deda! NOTE: This is a change from our previous listing. In amongst the turbulent demolition, construction and development of England's second city, this exciting young band headed up by saxophonist Xhosa Cole pays homage to Birmingham's cultural history so heavily rooted in the industrial revolution, as well as delving deep into the American jazz tradition.